AUCKLAND, NEW ZEALAND – President Rodrigo Duterte stopped briefly in New Zealand this week on his return from the Asia-Pacific Economic Cooperation (APEC) conference in Peru. In an exclusive interview with the New Zealand Herald, he twice referred to the country as Australia and asked the female reporter if she was married. Defending the president, The Philippine Ambassador to New Zealand Jesus Domingo described the conversation as “ambush journalism” and suggested Mr Duterte was feeling “groggy” after his long flight. Mr Duterte was in the South Pacific because he had chosen to take a circuitous route to APEC, deliberately bypassing the US. His decision was in response to criticism from Washington over his deadly war on drugs. 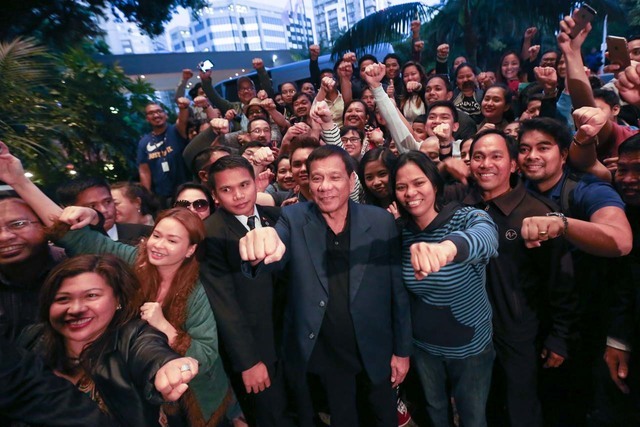 Flying via New Zealand added many hours to his journey, but it gave him a chance to connect with the local Philippine community in Auckland, even posing for selfies before he left the city’s luxury Langham hotel. There are large numbers of Filipinos in New Zealand, with the 2013 census recording 40,350 people with roots in the republic. This constitutes 1% of the total population and makes “KiwiPinos”, as they’re coloquially referred to, the 9th largest ethnic group in the country. Healthcare, agriculture and construction are three major areas that Filipinos work in. Some New Zealand commentators had urged Prime Minister John Key to block the visit in protest at Mr Duterte’s human rights record, but Mr Key answered that doing so would be in violation of Mr Duterte’s own human rights. Mr Key had previously told Duterte that there were better ways to deal with the drug problem. While he supported holding criminals to account, he urged an approach that would prevent the death of innocent bystanders and hapless addicts. It is clear that Mr Duterte did not heed this advice, which was offered during September’s ASEAN Summit in Laos. New Zealand and the Philippines appear to be making a concerted effort to improve ties. New Zealand’s ambassador to the Philippines, David Strachan, spoke in Davao City earlier in this month. In his speech he highlighted that there were 24 post-graduate scholarships available to Filipino students and encouraged applicants. In addition to this there are about 3,600 Filipinos studying in the country, one of the fastest-growing student populations in NZ. New Zealand has also been extremely proactive in recruiting construction workers from the Philippines in the wake of the devastating 2011 Christchurch earthquake. This has not been without controversy with regular reports of exploitation by landlords and recruitment companies on both sides of the Pacific.